Malathion is a widely used organic insecticide in large farms and fields and home gardens. The substance is also used as a mosquito/bug spray and against head lice and flea infestation. What are the Causes of Malathion Poisoning? What are the Signs and Symptoms of Malathion Poisoning? The signs and symptoms of Malathion Poisoning can vary from one individual to another. It may be mild in some and severe in others. Several systems of the body, such as the respiratory system, digestive system, nervous system, vascular system, urinary system, skin and ENT may be affected. How is First Aid administered for Malathion Poisoning? Who should administer First Aid for Malathion Poisoning? 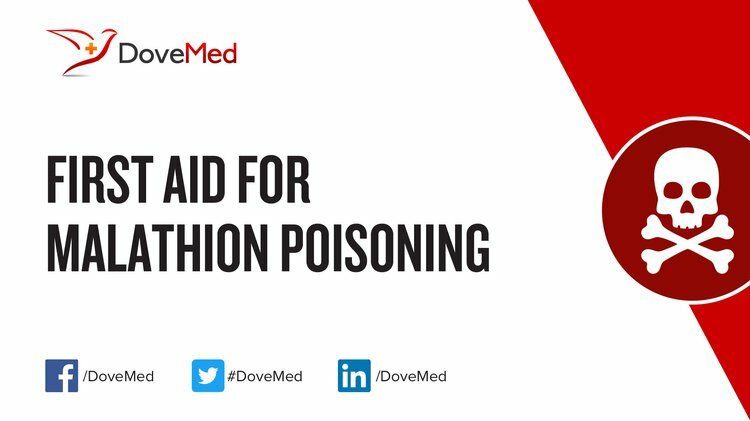 First aid for Malathion Poisoning is administered by healthcare professionals. What is the Prognosis of Malathion Poisoning? How can Malathion Poisoning be Prevented? Nor, F. M., Das, S., Naziri, M., & Zanariah, S. (2015). Fatal Poisoning by Malathion. International Medical Journal, 22(5). Khosya, S., Gothwal, S. K., Banga, V., & Meena, R. (2013). Malathion poisoning presented as intermediate syndrome and organophosphate induced delayed polyneuropathy in succession: a case report. J Clin Case Rep, 3(274), 2. Das, S., Chatterjee, K., Sarkar, N., Aich, B., & Dolui, S. (2013). Cholinergic crisis, intermediate syndrome and delayed polyneuropathy following malathion poisoning. Journal of Pediatric Intensive Care, 2(03), 137-141. Tchounwou, P. B., Patlolla, A. K., Yedjou, C. G., & Moore, P. D. (2015). Environmental exposure and health effects associated with Malathion toxicity. In Toxicity and Hazard of Agrochemicals. InTech. Vučinić, S., Zlatković, M., Antonijević, B., Ćurčić, M., & Bošković, B. (2013). Fresh frozen plasma as a successful antidotal supplement in acute organophosphate poisoning. Archives of Industrial Hygiene and Toxicology, 64(2), 273-277. Randa, S. H., & Saed, N. (2013). Alteration in oxidants, antioxidants and cytokines levels in blood of malathion exposed human and animal groups and the effect of flaxseed oil in alleviating malathion toxic effects. Eur J Biotech Biosci, 1, 8-19. Sharma, A. K., Tiwari, U., Gaur, M. S., & Tiwari, R. K. (2016). Assessment of malathion and its effects on leukocytes in human blood samples. Journal of biomedical research, 30(1), 52. Surapaneni, N., Tatsuno, B., & Silberstein, D. (2016). Malathion Madness. CHEST Journal, 150(4_S), 399A-399A.